French philanthropist; born at Marseilles in 1835; died at Cap Ferrat July 24, 1898; daughter of Joseph Jonas Cohen, and wife of Désiré Pollonais. In 1868 she published her "Rêveries Maternelles," in which she developed an entire system of education for children, and the next year she followed this with her "Philosophie Enfantine," a method of self-instruction for children. For her devotion to the wounded in the Franco-Prussian war she received the medal of the Red Cross Society; and her subsequent visits to the huts of the peasantry in the canton of Villefranche formed the basis of her most important work, "A Travers les Mansardes et les Ecoles" (1886). Amélie Pollonais was one of the founders of the "Gazette des Enfants," and after 1887 a contributor to the "Foyer Domestique." 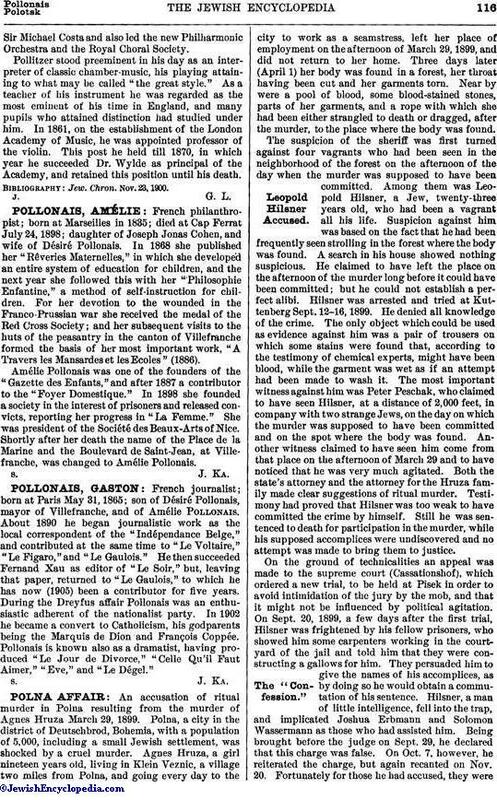 In 1898 she founded a society in the interest of prisoners and released convicts, reporting her progress in "La Femme." She was president of the Société des Beaux-Arts of Nice. Shortly after her death the name of the Place de la Marine and the Boulevard de Saint-Jean, at Villefranche, was changed to Amélie Pollonais.